Even if your mother forgets you, I will never forget you. Yes, these may forget, yet I will not forget you! The Bible tells us in 1 John 4:16 that God is love. He is the complete expression of every possible type of love. A father's love, a friend's love, the love of a bridegroom, etc., for 1 John 4 says that all love comes from God. In today's promise, we see a feminine expression of the love of God. 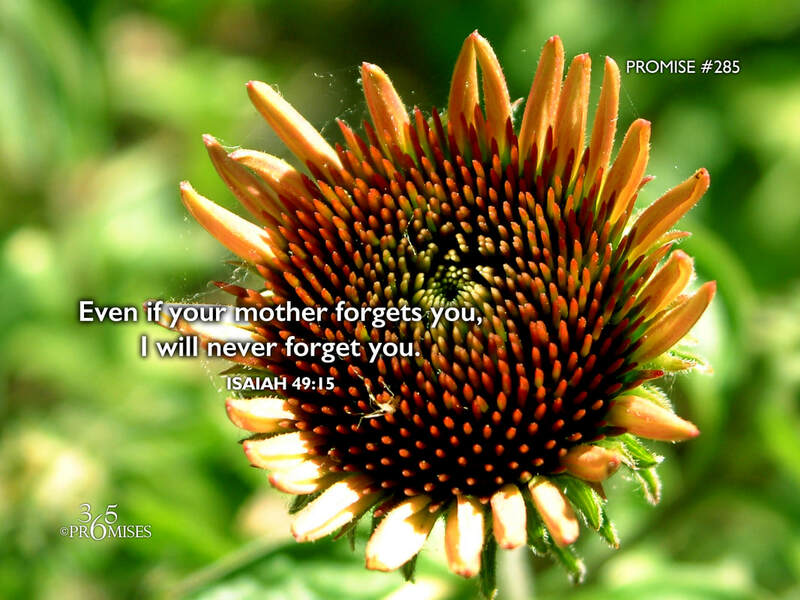 In this verse, God is posing a question... Can a mother forget the baby at her breast? Is it possible for her to not have compassion on the child that she has birthed? God goes onto say, even if she forgets you, I will not forget you! The following verse in Isaiah 49:16 continues as God tells us that He has engraved us on the palms of His hands. What a promise that we have! No matter what happens in this life, no matter what form of rejection we receive... even from our parents, God will not reject us! He will never forget us because He loves us with a father's love and He loves us with a mother's love too! May the love of God overwhelm us today with every love that we need. A father's love, a mother's love, the love of a friend, the love of a Savior... May we learn to live in this love (1 John 4:16) more and more for the rest of our lives.